This dish happened when I had a grapefruit that needed using up, and an avocado that I really wanted to eat. Avocados are great sources of both fiber and fat—and of course, they are delicious and very filling. Typically, I eat my avocado with salt and pepper, or I add shrimp and salsa to it like I did in this Mexican Shrimp Salad recipe. But sometimes you just need a quick salad with some tang and sweet and creamy texture all at once. 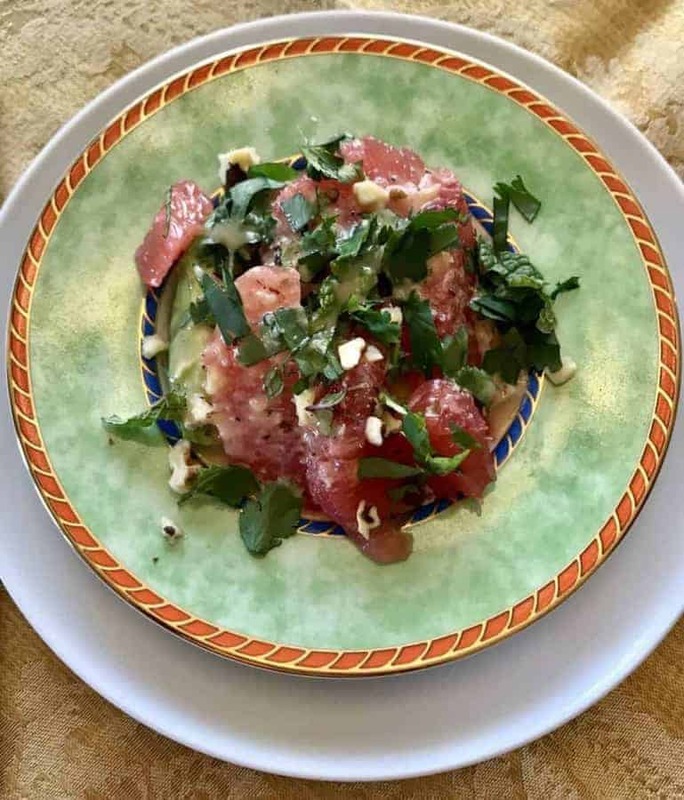 Enter this Avocado Grapefruit Salad. Don’t skip the mint and cilantro for this! If you hate cilantro, use some parsley. But the fresh herbs make this salad perfect. The other thing that really elevates this salad is the chopped nuts. I’m not sure why it helps so much, and normally I’m not a huge fan of mixed textures with creamy, but the nuts in here add a lovely taste. So unless you’re allergic to nuts, enjoy your Avocado Grapefruit salad with a sprinkle of pecans. Use oranges rather than avocados. It works but honestly, the oranges need to be either very tangy or very sweet. I like grapefruit better. Add butter lettuce to the salad. Add halloumi or feta cheese if desired. 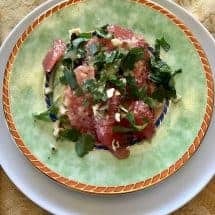 A delightful lovely light salad is perfect for an elegant brunch or just whenever you want a burst of a tangy summer taste in your mouth. Combine Grapefruit and Avocado with cilantro and mint for a fresh taste—a poem in your mouth. Blend together all ingredients for the dressing until it is all creamy and emulsified. Sprinkle with chopped mint and cilantro. Use oranges rather than grapefruit. It works but honestly, the oranges need to be either very tangy or very sweet. I like grapefruit better. Very good, I would make again. The dressing is tasty. I didn’t have any mint so just left it out. Next time I would toast the pecans.